Xe Lite, a healthy alternative to traditional energy drinks produced by new direct sales company Well-Beyond, contains a remarkable ingredient that improves fat oxidation and promotes better performance in athletes, according to a recent study done by a team of scientists in Germany. Whether you are a soccer mom, a weekend warrior, or a premier athlete, Palatinose™ can and will improve performance,” said Jeff Graham, Well-Beyond Co-Founder and Chief Products Officer. The ingredient is called Palatinose™, and the study was conducted by Professor Daniel König and his team at the Department of Sports and Sport Sciences of the University of Freiburg, Germany. It showed that with a pre-load of Palatinose™, endurance athletes “maintained a more stable blood glucose profile and higher fat oxidation, which resulted in improved cycling performance compared with maltodextrin,” according to a press release posted on beneonews.com. The website further reported that results gathered from the study highlighted that when athletes consumed a drink containing Palatinose™, they finished the time trial an entire minute faster, on average, and were able to pedal more powerfully in the final five minutes, compared to the maltodextrin control. The results correspondingly demonstrated that a higher fat-burning rate and lowered carbohydrate oxidation in energy metabolism were promoted. 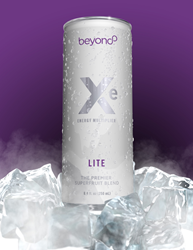 With its blend of antioxidant-rich superfruits and energizing botanicals, Xe Lite is a lower-calorie option for fitness-conscious consumers. In a review of over 30 energy drinks currently on the market, including the top-selling beverages, 97% contained added sugar, artificial colors, flavors, sweeteners, or preservatives. In addition to containing none of these unhealthy ingredients, Xe Lite provides longer lasting, natural energy that enhances performance, boosts endurance, increases alertness, and reduces fatigue. Study can be found here: http://www.beneonews.com/Press_Releases/2018/Koenig_Study/.